Sennheiser's latest entry into the world of uber premium headphones comes to us in the form of the stunning HD 800. New features include a completely new type of transducer and ear cup design. The HD 800 sets new standards with its innovative transducer technology. Measuring 56 mm, the transducer in the HD 800 is the largest that can currently be found in a dynamic head-phone. In simple terms: the more transducer surface area that vibrates, the purer the headphone sounds at low frequencies. However, transducers with a large surface area have the disadvantage that, at high frequencies, undesired resonances occur at the diaphragm, resulting in distortions in sound reproduction. The new design principle of the HD 800 resolves this dilemma. "Sennheiser's patented ring design for the diaphragm minimises the distortion of the sound image, even with a transducer as large as 56 mm," explained Axel Grell, acoustics developer at Sennheiser. The result is impressive: the HD 800 has brilliant trebles, precise bass reproduction and an exceptionally clear sound image. The frequency response is an unprecedented 6 to 51,000 Hertz. Audio recordings do not become a true listening experience until we they are perceived with spatial extension - as if we were sitting in a concert hall or listening to a live jazz session. The new HD 800 offers precisely such a sound experience. "Today, most music is made to be reproduced by two loudspeakers, which form an equal-sided triangle together with the listener. This results in a sound field close to the ears that is at a slight angle to the head," explained Axel Grell. This causes the sound to be reflected into the ear canal with slight time differences. 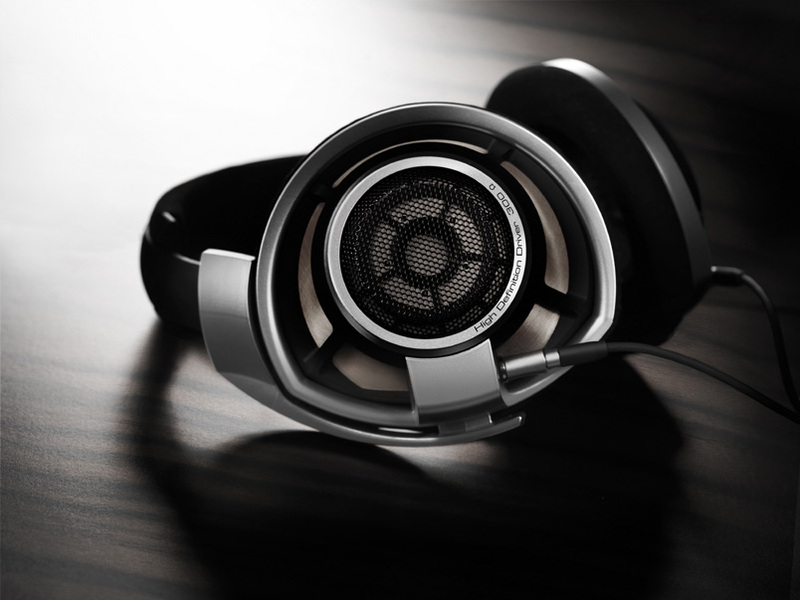 The HD 800 simulates this effect by directing the sound wave to the ear at an angle of 45 degrees. No other manufacturer comes as close as Sennheiser to achieving a spatial listening experience with headphones. LAS VEGAS - January CES 2009 - The new standard in premium headphones, the HD 800 from Sennheiser, offers an extraordinarily brilliant sound image and stunning spatiality. Their dynamic, completely open-back design combines innovative technology with carefully selected materials and the pinnacle of German workmanship. The result is a level of performance, quality and attention to detail that is clearly audible. The key components of the HD 800 are a completely new type of transducer and the innovative ear cup design. In total, this new sound sensation features no less than three distinguished patents. Their circumaural ear cups fit comfortably around the ears without aggressive lateral pressure for hours of music enjoyment. The material used for the ear pads is Japanese Alcantara, which is particularly friendly to the skin and easy to clean. All other materials have also been carefully selected - not least to optimally support the outstanding acoustical properties of the HD 800. "We allowed ourselves a lot of time to perfect the HD 800," said Maurice Quarré, Product Manager Home Audio at Sennheiser. "Not only to develop the technical intricacies but also to select the finest materials to make it perfect in every detail." As a result, the HD 800 has an exterior design that perfectly reflects its outstanding sound quality: a puristic design language and a black/silver finish give the headphones a look of exclusive elegance, turning them into a true designer object. And all this is 'Made in Germany': the HD 800 was developed and designed at Sennheiser's corporate headquarters in Wedemark, Germany. The new headphones will be produced there too - with the usual meticulous attention to detail.